Atlanta’s public monuments are narrative components of the historic landscapes of the City. They are in jeopardy from ongoing disregard. Demolition, removal, vandalism, theft and lack of maintenance are also evident in Atlanta’s oldest public park, Grant Park. In this park the following are known to be missing; 2 cannon, sculptures of an angel and a stag, a marble sundial and a monument to Colonel Grant. A major restoration of a public monument was accomplished by the APC in the spring of 2012. The Sidney Lanier monument on the east side of the Piedmont Park's Active Oval now stands with all of its components in tact. For more on this preservation success click here. 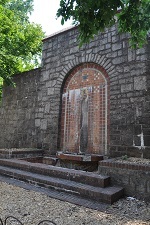 Smith Park and Fountain, located at the intersection of Monroe and Piedmont road, is one of the remaining vestiges of the foundations of Atlanta. Created from land donated by a few of the developers of the Morningside Lenox Park neighborhood, it would be named for one of their own, James Robert Smith. When the park was dedicated in 1932, a small plaque was erected to honor Mr. Smith, saying of him: "a man so zealously devoted to the growth and civic betterment of our fair city, Atlanta". Since that time, the park and fountain has served its community for over 80 years. In recent years however, the fountain and surrounding pond have run dry and allowed the fountain to deteriorate. The Atlanta Preservation Center advocates for the restoration and preservation of this monument due to its significance to the formation of one of our historic intown neighborhoods.